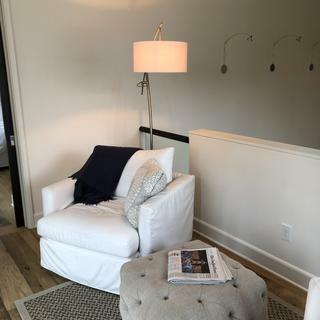 Place this brushed nickel arched floor lamp next to a couch or reading chair for stylish and adjustable lighting. Boom arm 69" maximum overall height x 41 1/2" wide. Base is 16" wide. Shade is 18" wide x 9 1/2" high. Liked the modern look and the height. 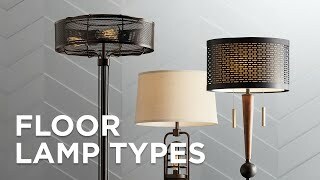 I need a simple and stylish lamp for ambient lighting in a living room. This lamps seems versatile because it has a pivoting arm for when I want to use the lamp for reading. The style is fun and yet classic enough that I could keep this lamp for many years without becoming tired of it. I liked the style. And, that I can read with the light direction. Love the simpleness of it. Hopefully, it works in my room. If not, I know it can be returned without a fee. Perfect! Style and cost. My second choice was $200 more. is the only on/off switch on the base or is there another on top? BEST ANSWER: The only on/off switch is a Disc with a push button that comes off ot the cord. Possini Euro Brushed Nickel Boom Arched Floor Lamp - Style # V2696 is this lamp Dimmable or 3 way? BEST ANSWER: Hi - This includes an on/off floor switch. But, this can be dimmed when paired with dimmable light bulbs and the proper dimmer. 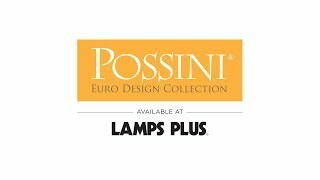 How heavy is the base on the Possini Boom Arched Floor Lamp? BEST ANSWER: It is quite heavy and gives weight to the piece. It is a beautiful lamp but mine broke and fell on my head. The welding must have been damaged in shipping and it just took a while for it to give way. Very heavy! Doesn’t move easily even when moving it. Does it have a cover on the underside of the shade so you don’t see the light bulb? BEST ANSWER: No - this does not feature a bottom diffuser. No. If you looked up under the shade you would see the light bulb. It does have a double shade so the bulb is diffused. Does the shade have a diffuser? BEST ANSWER: no, but with the right bulb it will be as bright or as diffused as you need. Does lamp take a 3way bulb? Can it accommodate a remote control? BEST ANSWER: This lamp does not accommodate a 3-way bulb. However, you can use a floor dimmer or remote control dimmer. No. This has a floor switch and is not a three way. I do love the clean lines. 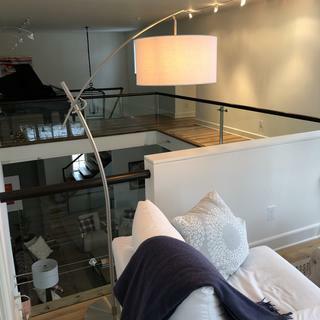 Is this lamp adjustable in agile and height? BEST ANSWER: Yes, the boom adjusts up and down to a maximum height of 69 inches. The arm is adjustable and allows you to raise or lower the height of the lamp. The main pole of the lamp is not adjustable, but there is no need for it to be. The quality of this lamp is very good. The height. Of the main support pose is fixed. The height of the lamp and shade part is very adjustable. Overall, a very nice lamp! Very nice, simple lines, seems to be very high quality. This is a beautiful lamp. Very sturdy. It arrived packaged well. No problems assembling. I tried a few different bulbs to get the right lighting. I'm using it over the corner of my sectional couch. I wish this lamp worked with a 3-way bulb as sometimes I just want to lighten up the area and other times I want to read. It's also a bit inconvenient having the on/off switch on the floor as the cord is behind my couch, which isn't the easiest to get to. Cons: I wish it allowed 3 way bulb. This lamp has beautiful lines, but is also designed to be remarkably flexible in where it casts light. I'm using it for general light in a living room corner, but the illumination is good enough to read by as well. Love the floor switch! I placed this next to the chaise end of my sofa where I lounge to reach or watch tv. It is a perfect accent to my new modern decor. It is not only functional but very stylish as well. The boom can be adjusted for the right touch! Just love it!! We hope you like the photo styled by @kspaetti - look for more exciting images and video on our product pages! We put this in our formal room, the room that no-one ever sits in! We needed a light to brighten the space and this has done the job. 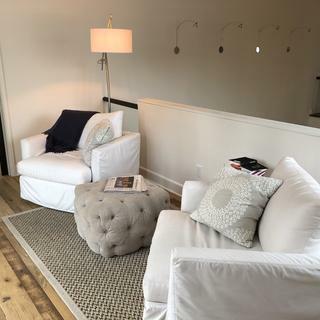 It adds a contemporary, stylish flare to our open floor plan along with the inviation needed for the space. Great purchase. Great form and function. Totally up-scales any space. I was super pleased at the quality of the lamp. Very well packed and easy to put together. Highly recommend! 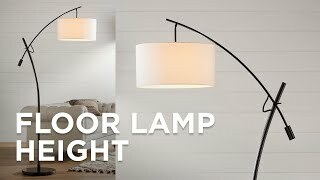 Love the coverage this lamp provides in a dark area of family room. Very sleek modern look. I have this lamp two stars, because the shade I received was damaged, and Lamps Plus replaced it immediately with ease. However, within a week the top metal portion snapped. I emailed Lanps Plus and haven't heard back. Broke within a week, sadly. I loved it before it snapped. Love this lamp!! Its large barrel shade and the unusual slant of the arc and base, finished off by a modern, weighty finial, really cause this lamp to make a huge statement in the room. I’ve received numerous compliments, and I highly recommend it. Such an Elegant and Practical Purchase! Decided to splurge on a "real" piece of furniture with this lamp, and so happy I did. Adds elegance to my modest bungalow home. Love Lamps Plus! Solid, secure base. Lovely lines and very good illumination. A fine purchase. We're pleased. I did buy this lamp two times . . .
After a few weeks this lamp fell on my head as I was sitting on my couch with the lampshade portion above me. Welding or whatever broke. Returning. I love the lamp. Fits beautifully into my living room. Would highly recommend it. All my friends love it!! The lamp is 10 stars. It is a very stunning lamp that looks like 1000 bucks. it is quite large so be sure to measure. That isn’t a complaint. Assembly was incredibly easy. The only thing I have to say that might be construed negative is as follows: The part where you adjust the lamp head to go up or down, are like two pieces with teeth that fit together. I would not suggest moving it very often because I would fear that those teeth would wear down because the metal feels somewhat soft. Other than that, I would highly recommend this lamp to anyone. It looks just like the photograph. Having spent $300 for this lamp, I assumed the quality would be decent. We couldn't assemble it at first because the threaded piece that is supposed to secure the two parts of the pole is not fixed: it transferred itself from the bottom portion of the pole to the top when we started to screw the two sections together, and got stuck there, out of alignment, so that we could not attach the two sections. We sprayed it with WD 40 and used a wrench to separate the threaded peice from the pole. I can't believe what passes for acceptable workmanship anymore. I'm not expecting a lot of mileage from this lamp; we're storing the boxes in the basement in case we need to return it. I purchased this exact lamp about two years ago and have loved it until today. I heard a loud noise from my den and rushed into my living room to find the top part of the lamp came crashing down onto my dining room table. 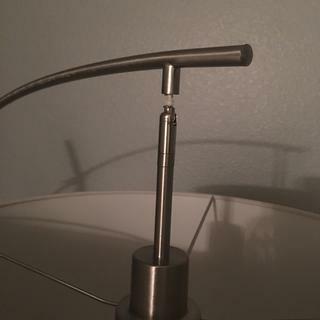 I tried screwing the top post back into the center post but the threads were damaged. My guess is the lamp is out of warranty and I will have to purchase a new one. Too bad because it goes very well over my table. Fits with our modern décor and our Possini Euro desk lamp in the same area. Love the lamp. Exactly what we had hoped for. Looks good in our living g room. My own favorite reading light. Very Happy with our Lamp and will be going back for more. 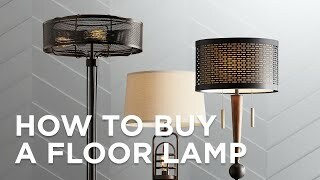 As we would rate this a 10 great place to get all your lamp needs. Work perfectly where we placed it over our new couch. No pressure at the store we made our selection then were helped with all our questions answered. We highly recommend buying all your lamp and out things from these guys. It is a very heavy sturdy lamp yet it has delicate lines and feel like it softens the room. We love it.